The listing here includes about 40 minutes of music. There are also several later melodies called You Lan (which can be translated Reclusive Orchid as well as Secluded Orchid) that I have not yet reconstructed (see for example one dated 1525). This is the world's oldest surviving fully notated instrumental melody (7th century). The preface does not connect to any theme or story. 2. "方秉蕑兮 It is time to gather jian"
士與女，方秉蕑兮。 So it is time for men and women to gather jian (Waley: scented herbs). This illustration seems to show a type of eupatorium. It is from "毛詩品物圖改". 浪花岡元鳳撰 (Genpō Oka) I do not know from what this edition was "revised", and I am not sure about the marks in the text. They seem to be kana giving Chinese pronunciations for Japanese readers, but there may also be bopomofo, the Taiwan system of indicating pronunciation. Another book also purporting to illustrate animals as depicted in the Book of Songs is（清）徐鼎 Xu Ting (Qing dynasty), Commentary on Illustrations from Mao's Edition of the Shi Jing (毛詩名物圖說 Mao Shi Ming Wu Tu Shuo). This work, in three volumes, has been copied in ctext.org. Both the Zhongwen Dacidian and Hanyu Dacidian (I. and II. below) connect lan with compositae and magnolias as well as with orchidae. I. 33297.0 蘭 lan: A. 菊科香草名。即蘭草，一名蕑。 "The name of a fragrant plant of the ju ke family. (31989.50 菊科 ju ke are defined as compositae, a different family from orchids); another name is lan cao ("Eupatorium chinensis"), and it is also called jian (see footnote 1)." It then quotes from the Book of Songs, Mao#95, which uses the character jian (方秉蕑兮, see footnote 1 and the illustration at the top). B. 蘭科香草名有數種，一莖一花者為草蘭，一莖數花者為蕙蘭，心白者為素心蘭，福建產者為建蘭。 "The name of a fragrant plant of the orchidae family, of several types. One flower per stem are called cao lan (32629.349 cymbidium virens or cymbidium), several flowers per stem are called huilan (32677.44, a genus of lan), those with a white center are called suxinlan (27924.17 a genus of lan), those grown in Fujian are called jianlan (Fujian orchids, perhaps the same as Taiwan orchids)." The earliest reference it gives is 毛詩、草木鳥獸蟲魚疏 the Mao (Edition of the Classic of) Poetry, Commentary on flowers, trees, birds, animals, insects and fish. C. 木蘭也，花如連、香如蘭。 "Mulan, (a deciduous magnolia) with flowers like a lotus and fragrance like an orchid." The earliest reference given is 文選 Wen Xuan. II. 9/626 蘭 lan: A. 蘭花 lan hua; the examples clearly refer to orchids, but the earliest reference is from the Ming dynasty. B. 蘭草 lan cao, defined as 澤蘭 ze lan, which in turn (6/167) are defined as 菊科 ju ke (i.e., compositae); the references for this include 易、繫辭上 the first section of the 繫辭 xici 4th c. CE commentary on the 易經 Yi Jing (by 韓[康]伯 Han [Kang]Bo, which says 同心之言，其臭如蘭 "two people speaking with one mind gives a fragrance like the lan"), 左傳、宣公三年 Third Year of Duke Xuan in the Zuo Zhuan (see Legge, pp.292-4: Duke Wan's concubine dreams that heaven sends her a lan, saying that as the most fragrant flower it should represent the state; after this Duke Wan gives her a lan when he lies with her, resulting in a son they call Lan), and 離騷 Li Sao (lines 11-12, twining autumn lan to make a garland). C. 木蘭 mulan, defined as 一種香木 a type of fragrant wood; references include a commentary in which 朱熹 Zhu Xi says the lan in 楚辭九歌 Nine Songs from the Songs of Chu refers to mulan (see I.C. above). It might also be noted here that in the Book of Songs the character 蘭 lan is used only in Mao#60 芄蘭 Wanlan (31375.1; Waley: "vine bean"). 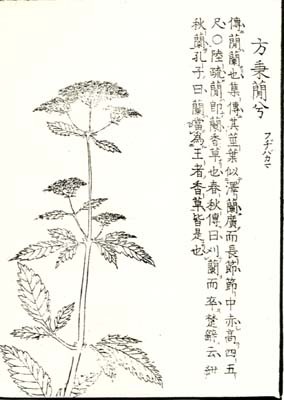 The illustration at right, showing a broad-leafed wanlan twining around a narrow-leafed 葭菼 jia tan (32155.21, see Mao#57; Waley: "reeds and sedges"), is from the above-mentioned Revised Nature Illustrations for Mao's edition of the Book of Songs. More recently "A Student's Dictionary of Classical and Medieval Chinese", p.252, puts lán in the aster family and says, "for pre-Song texts, lán is invariably Eupatorium, not 'orchid'." In sum, it is open to question exactly what flower is intended by early references to lan: at times it could refer to plants that are not true orchids at all. And I am still looking for a description or illustration that clearly identifies any of the lan in the qin melody titles with the orchidae family. 4. Orchids: flagrant beauty or subtle fragrance? This aspect is described in Wolfram Eberhard, A Dictionary of Chinese Symbols, London, Routledge & Kegan Paul, 1986, pp,219-220, as follows. The word lan can also mean lily or iris. The symbolical significance of the orchid has to do mainly with its scent. And "orchid-room" is the dwelling-place of a young girl or the bedroom of a married couple. A beautiful woman's breath is like the perfume of an orchid. The word lan = orchid occurs in women's names only.